Plans and Tools Required :: Go-kart powered by a lawnmower engine! All the Parts, Components and Tools required to make this Kart. Below are the three Drawings from the total of 21 in this complete set of Kart Plans. This is the third drawing in the complete set of plans for this go-kart. It shows all the parts required, and labels each part with a number. For a description of each part required, take the associated number and compare to the table on Drawing 4 below. 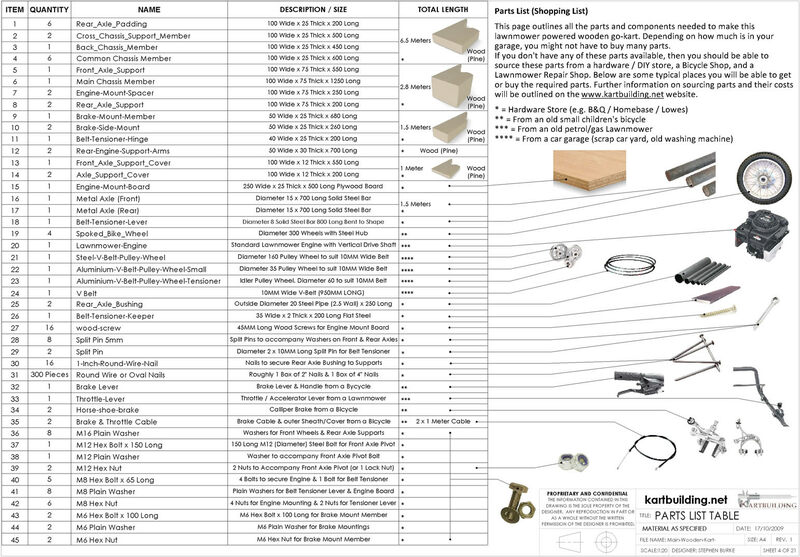 Most of the parts shown in this Drawing can be obtained from local DIY stores. It might also be possible to obtain some of the parts from a local car/lawnmower repair shop. You can ask your neighbour also! They might have lots of old parts lying around, and perhaps an old unused and rusty lawnmower with an engine you could use. 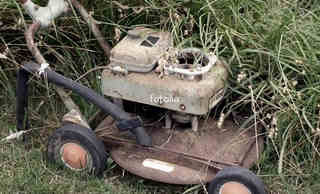 A typical rusty lawnmower, which the engine could be salvaged from, fixed and repaired. Lawnmower engines are very reliable, and easy to repair and get working. A visit to your local scrap yard would be a good idea. You can obtain the parts required from old bicycles, lawnmowers, prams, motorcycles, mopeds etc. Don't be too worried if sizes are too big or small. Adjustments can always be made to get a component/part to fit. Parts such as nuts, bolts, screws and some metal tubing can be bought or taken from old parts and machines. The quantity of each of the various parts required can be found on this drawing. Parts in the table are numbered to match the components as shown in Drawing 3. The quantity and various parts shown are an indicator of what is needed for this kart. 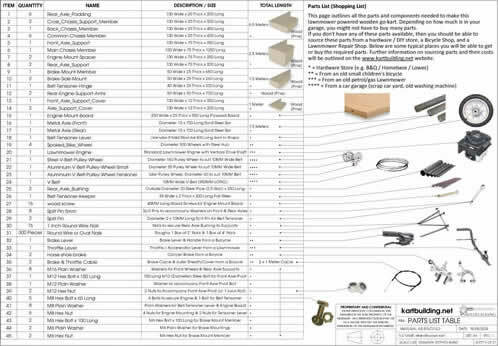 Also listed in this table is mentioned where you will be able to get / buy each of the parts. 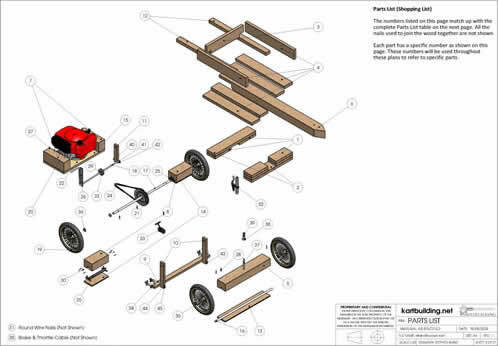 This drawing shows the tools required to make this lawnmower powered go-kart. There are lots of options available. 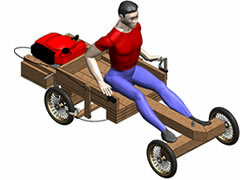 Lots people will already have most of the tools and equipment required to make this kart. If you don't you can ask your neighbour kindly if you could borrow their tools. 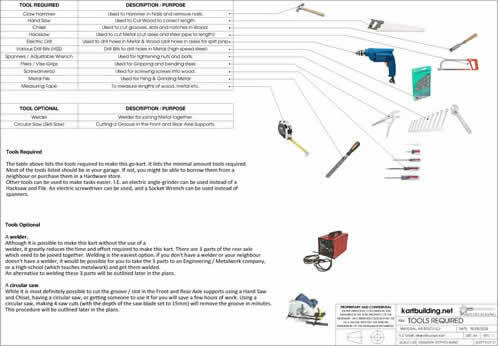 The purpose for each tool is also mentioned. 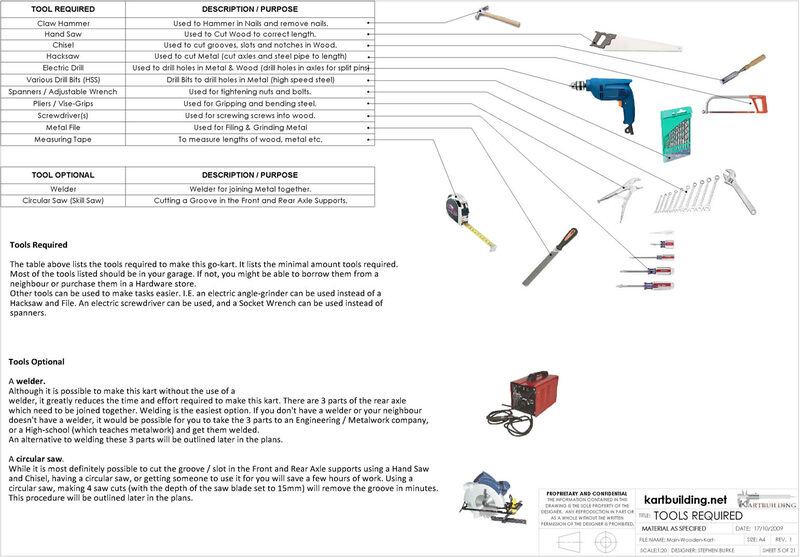 There are other tools which can do the same job, however this Drawing list the most commonly available tools for each of the jobs.